About 360-400 species of annual or perennial herbs or small shrubs, mainly in the Northern Temperate Zone in Eurasia and North America of which about 200 in the FSU. Only a few are decorative. A. arbotanum L., old man, is an old medicinal and spice plant long in cultivation, A. dracunculus L. is a well-known spice plant and A. stelleriana Besser has ornamental application. Other species can be used, especially in extreme conditions because most species of the genus come from dry regions, with hot climates. Central Asia (Turkmenia, mountain regions). On clay soil on slopes and on limy, gravelly soil. Taproot thick and woody. Perennial or sub-shrub 40-50 (80) cm. Stems clustered, much branched towards the top. Basal leaves petiolate, 2 or 3 times pinnately dissected, upper leaves linear. Flower heads sessile, erect, oblong, 3-4 mm long, in groups of 2 or 3 in a dense panicle. Flowers 4 to 5 per head, yellow. V - early spring to late autumn (in nature March to November). Fl - July-August. Fr - September. P - by seed and cuttings. Does well in a very dry and hot climate, staying green the entire season without watering. Requires a sunny position. Good for group planting. Z 6 (5). New. A. gmelinii Web. ex Stechm. Siberia (southern regions), Central Asia (northeastern region), Far East (southern continental regions and Sakhalin Island), North China and Mongolia. In open forests and in meadows and clearings. Taproot thick up to 3-5 cm diam. Perennial or sub-shrub 50-100 cm, richly branched. Leaves petiolate, elliptic, bipinnately dissected, densely white or grey pubescent beneath, loosely pubescent above. Flower heads globose, nodding, in a short panicle. V - early spring to late autumn (in nature March to November). Fl - August. Fr - September - October. P - by seed or cuttings. Does well in the dry climate. Requires a sunny position. Good for group planting. Z 5 (4). 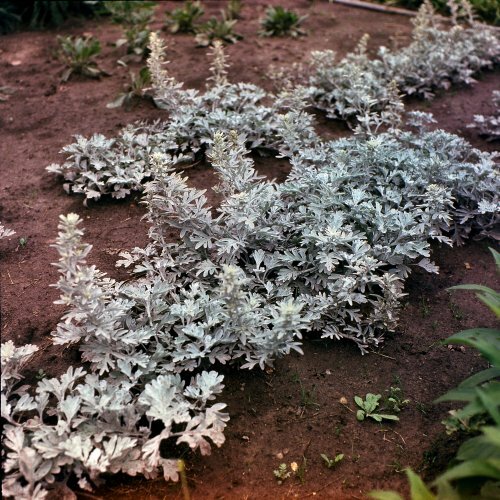 A. schmidtiana Maxim., silvermound mugwort. Far East (Amgunskiy region, Sakhalin, southern Kuril Islands) and Japan. On sandy sites near the sea shore, along streams, on cliffs and rocky slopes. Perennial or subshrub 15-30 (60) cm. Stems unbranched and bare at the base, much-branched towards the top. Leaves petiolate, 4-5 cm long, bipalmately compound. Upper leaves linear, 1.5 cm long. All leaves densely silver-silky tomentose. Flower heads stalked, semiglobose, in clusters. Flowers white. V - early spring till the first frost. Young branches overwinter with green leaves. Fl - August. Fr - October. P - by seed or cuttings. Self-sowing plant. Requires a sunny position, and well-drained soil. Z 5 (4). A. stelleriana Besser, dusty miller, old woman, beach wormwood. Far East (Amgunskiy and Ussuriyskiy regions, Kamchatka, Sakhalin, southern Kuril Islands), Scandinavia, Japan and North America (Alaska). Along streams, near the sea shore on gravelly soil, on slopes. Creeping perennial. Sterile stems numerous, 20-30 cm. Flowering shoots solitary, rarely 2 or 3, thickened, up to 50 cm. Leaves petiolate, spathulate or ovate, deeply toothed. 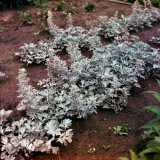 Entire plant silver-white tomentose. Flower heads stalked, cup-shaped, 5-8 mm long in spike-like inflorescence. V - early spring to late autumn. Fl - August. Fr - October (not every year). P - by seed or cuttings and also by division. Does well in sunny position and on well-drained soil. Z 5 (4). A. aurata Kom. Annual from the Far East (Ussuriyskiy Region), Japan, northern China and Korea. The numerous golden flowers make the plant very attractive. New.